Barb Wire Leather Cords 2.5mm round, regular color - magenta. 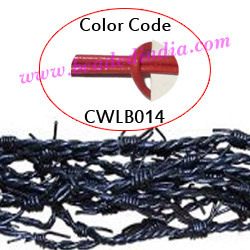 supper quality 2.5mm round barbed wire leather cords, regular color - magenta as per the photograph, pack of 25 meters. Barb Wire Leather Cords 1.5mm round, regular color - turquoise. Leather Cords 4.0mm flat, regular color - chocolate. Silver Plated Headpin, size: 2 inch (51 mm), head size : 2x7mm, weight: 0.39 grams. Silver Plated Brushed Beads, size: 11x12.5x12mm, weight: 1.31 grams. Leather Cords 2.5mm (two and half mm) round, metallic color - ice blue. Copper Metal Beads, size: 12x7.5x5mm, weight: 0.64 grams.